Chat scheduled for Thursday at 2 p.m.
One of Metro's new pedestrian bridges for the Silver Line. Fairfax County residents and others with questions about the looming addition of the Silver Line to the Metrorail system will be able to pose questions to county officials. The county is hosting an online chat Thursday at 2 p.m. for residents to ask questions not only about the Silver Line but also about plans to modify county bus service to make the most of the new rail line. Plans call for the first phase of the multi-billion dollar Silver Line to begin service by the end of the year. The new stations will run through Tysons Corner to Reston. Nick Perfili, Dulles Rail project planner, and Christy Wegener, manager of operations for the county's Fairfax Connector bus service, are scheduled to take questions. 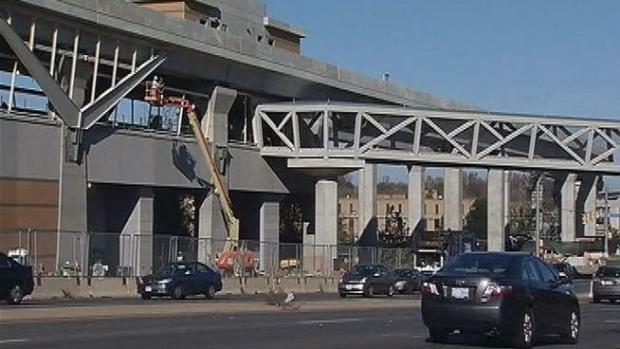 News4 transportation reporter Adam Tuss answers some of the questions viewers had on Metro's Silver Line, the first phase of which is set to open later this year. Questions can be submitted at www.fairfaxcounty.gov.